Not a lot of mixing on this episode, my crossfader has left the building, but the tunes are rocking. As usuall a little old and a little newer Electro. Enjoy the beats! I don’t get many oppritunities to crank up the 10s and 12s and really get the Bass flown’, but today little ones were not at home and we got on it. Did pretty good on the mixing tip considering I haven’t mixed more than 3 records in several months. Great tunes from front to back. Was wanting to hear the first tune, so put in the three DnB tunes. First tune dedicated to all the hatas! "There are no problems, only solutions". This podcast features some great tunes. Uprokkers feat. Jazzy Jizzla rolln’ in after one of my favorite new releases “Breakn’ Out”. As usual really no rhymn or reason to the tracklist, just the tune I’m diggn’ at the moment. A little shorter than some 75 minutes strong. Got in a couple great mixes, laced with drops. Did regress into some dirty dirty Hip Hop, btu it s in the blood ;). No mysteries here just great Electro. Enjoy! when is the show? time and day? i cant found the info and i lost it every week! thanks for the DL DV! well as far as a live show, due to my contribution to over population, i have four churlin ' i'm unable to stand in one place for 2 hours i rolled in Cozz's current slot for four years previous. and sorry for the improper spelling! Thanks for these awesome pods, excellent tracks. Listened this yesterday and today I'm gonna need another dose! ah ah cool!! we have to do pression to get you on slot!!! lukas i have the same problem as you!!! lol!!! Reached into my limited stack of Hip Hop vinyl and pulled out some great tunes. Some of my favs on this one. The Electro beats rolled in and were briefly interrupted by the Dynamic Breakers doing “Dynamik” (which is Electro too ). Artist like Danny Electro, Microthol and Signal Type help make this episode a solid presentation of great beats. Rapped it up with Newcleus’s unreleased masterpiece Computer Age 2.0. Hope you enjoy! Thank you for downloading and keep it locked to GFR! i'll start putting "Tentative Show Summary", Sorry about that D.R. Nice set again, some good tunes in there. Nice to see Danny Dwellz track in there ! Filling in for Lloyd da Zoid and Dj Diplomat this was my first live show on GFR since May, Started out with a most amazing mix by DJ Xed of the Crobot Crew straight out of Croatia. This mix features the BEST of Old School Electro B-Boy tunes. If you can listen to this mix without doing a couple pops, you are better than me. To DL the full mix go to electroempire.com or electroalliance.com and look in their music post sections. After Xed, I get on the tables and play some hard hitting Electro beats, including, the Invisible Rockers forth coming tune. Overall a good set. Enjoy! Thanks for tuning in and keep it locked to GFR! Note: Due to the date recorded, some information may be out of date. First episode in a couple of weeks and it’s a good one. First up is a mix I did two years ago on Thanksgiving-lb.IP-Thanksgivizing Mix. Good tracks and the mixing isn’t bad either. Afterwards, I play thirty-five minutes of Electro, briefly interrupted by two Hip Hop tracks. 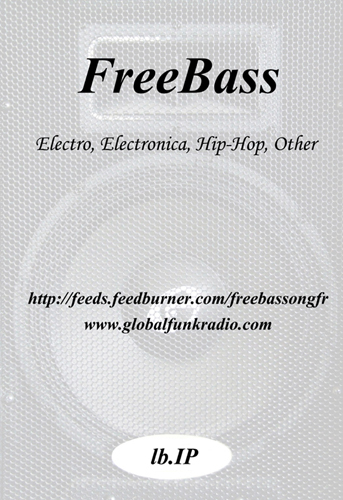 Hope you enjoy and thanks for listening to FreeBass on Global Funk Radio. Dynamik Bass System – She’s Gotta Have It! Cheers and keep it locked to GFR!